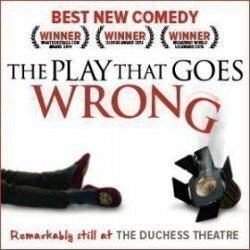 After a smash hit UK tour this hilarious play, which has won numerous accolades from reviewers who have laughed themselves silly over it, returns to the West End. If you haven't seen it yet and you love classic British comedies like the TV series Fawlty Towers, this one's for you. Funny just doesn't do it justice! The Duchess Theatre presents a grand, wide frontage on Catherine Street with three sets of typical late 1920s windows and a broad arched entrance complete with archetypal Art Deco typography. The Duchess, one of the West End’s smallest theatres with a proscenium arch, was designed by Ewen Barr and opened for the first time in late November 1929. The old ‘ancient lights’ law, which dictated that new buildings were not allowed if they blocked the light from nearby buildings, meant the site was empty and derelict for many years before the building’s creation, after being bombed in World War One. The issue was solved by building the new theatre with its top stories set back from the main part of the building and the remainder, including the Stalls, set underground, down in the basement. A great idea… but ever since, the owners have had to pump the ground water out of the basement every now and again via a couple of vast pumps! In 1934 the theatre was redecorated to a design proposed by the wife of JB Priestley, Mary Wyndham Lewis. Despite its age, the Duchess Theatre still has a load of original features: the original stage curtain, now more than eighty years old, and the stage itself, as well as some of the theatre’s special backstage equipment and one of the lifts. These days the Duchess theatre, a delightfully intimate venue with fewer than 500 seats arranged over two levels, is owned by Nimax theatres. Famous theatre productions at the Duchess include Noel Coward's smash hit Blithe Spirit, which enjoyed a very long run of 1,997 performances back in 1942. Tom Eyen's The Dirtiest Show in Town played almost 800 times in the ‘70s and Oh! Calcutta! Ran at the theatre from 1974 to 1980, thrilling crowds for an astonishing six years. And the infamous The Players Theatre Company picked the Duchess for their Late Joys Victorian Music Hall show from ’87 to 1990. The theatre has also been home to a large number of well known performances and productions, including Behind the Iron Mask, Betrayal, Birthday Party, Breakfast with Mugabe, Buddy, Butley, Collaboration and Coyote On A Fence. Plus Damsels in Distress, Ecstasy, George Gershwin Alone, The Hound of the Baskervilles and many more. There are two special wheelchair spaces in the Stalls and transfer seating is available to any aisle seat in the Dress Circle. 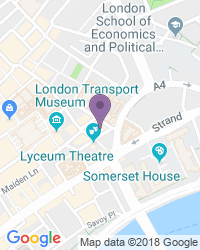 We’re your top destination for a wide variety of seat types and prices, with excellent availability on the full range of Duchess Theatre tickets.